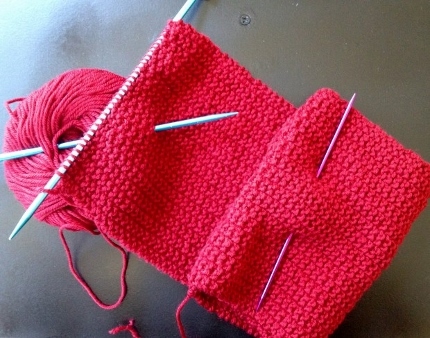 Whether you’re traveling this summer or just want to do a bit of knitting on the go without dragging your whole knitting tool arsenal with you, there are some great hacks you can do to use regular household items to aid your knitting. Amy from Love Knitting has a great list of things you can use instead of other things. Some of these are classics, like using scrap yarn as a stitch marker or a wine bottle cork as a point protector. But I don’t think I’d have thought to use dental floss as a stitch holder (I usually have some extra yarn around I can use for that purpose) or using a DPN to hold your folded scarf in place so it’s not warming up your lap when it’s hot outside. That’s pretty brilliant right there. Her suggestions for common household measuring tools are great, too. It’s a good idea to measure things you always have with you like your hand (mine’s about 6.5 inches from wrist to end of the longest finger) that you can use in a pinch. Or always carry a business card (usually around 3.5 by 2 inches) or an index card (3×5) in your bag, which is handy for jotting notes as well as measuring. Do you use any common household items in your knitting? I’d love to hear about it! When knitting cable stitches I have had to open up a paper clip and us it as a holder when my cable stitch holder went missing. I have also used large size baby diaper pins to hold a few stitches away from the others for part of a project.